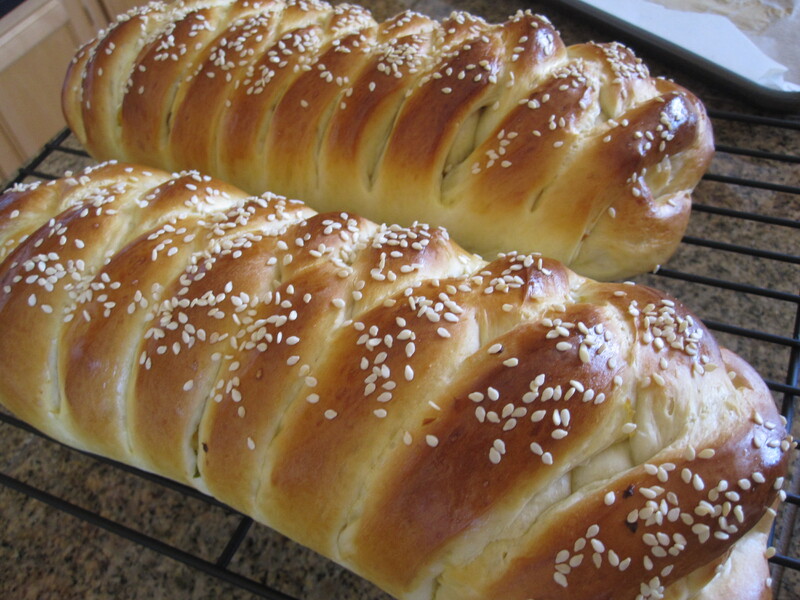 Ever since my first attempt with braided bread I have been wanting to make it again, but this time I decided to change the fillings to savory one. In this case, it’s preserved mustard green 咸酸菜. 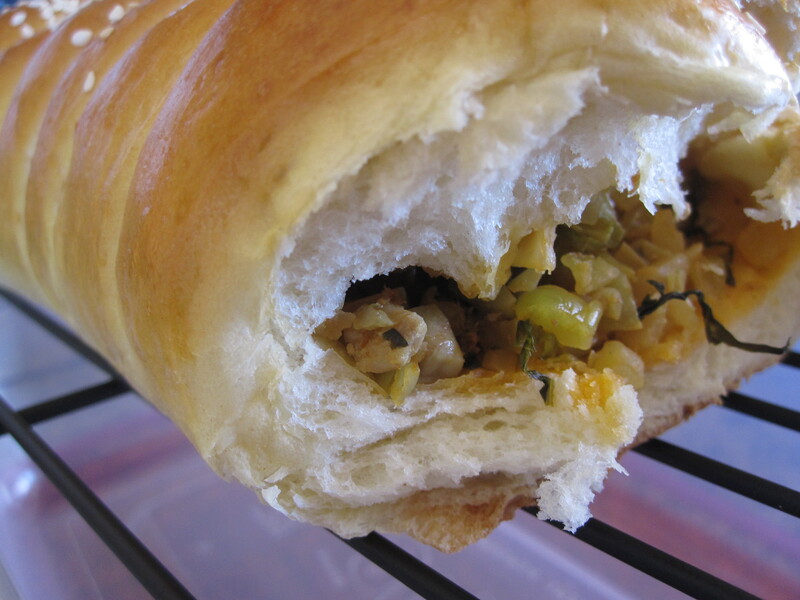 I want to create a filling with complex flavor– spicy, slightly salty and yet hint of sweetness of the filling, balanced with the slightly sweet bread– a bite of it will wake up your palate and ask for more. I bought a pack (about 10 oz.) of preserved mustard green, but found out it was not enough to be the main ingredient. Instead of running to the store to buy more, I decided to substitute with a pack of pickled mustard 榨菜. Lightly knead the dough on a board a few times to punch out big air pockets trapped inside. Cut the dough into 2 equal portions. Roll out each dough to a 8×11 inch rectangle/oval of 1/2 inch thickness. Scoop some filling on the middle 1/3 of the dough. 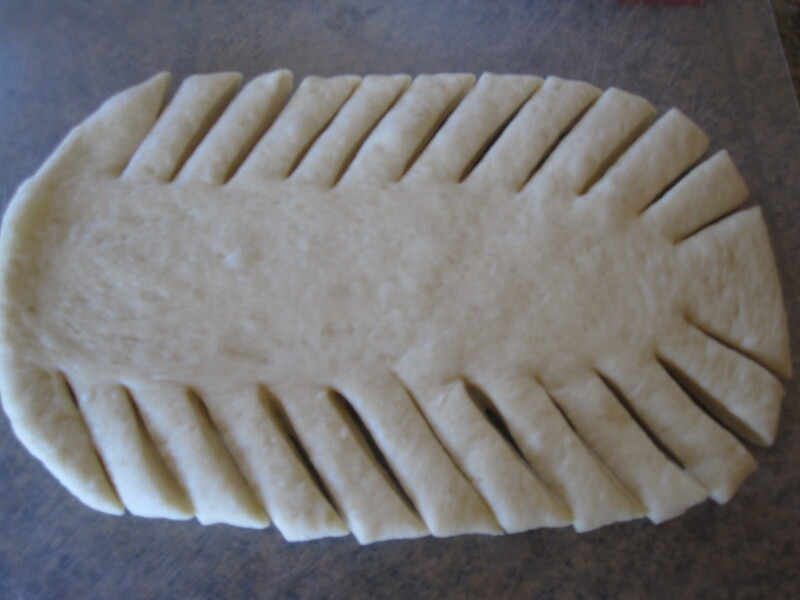 Make diagonal 1-inch strips on the other 2/3 of the dough. First fold one ends over the filling. 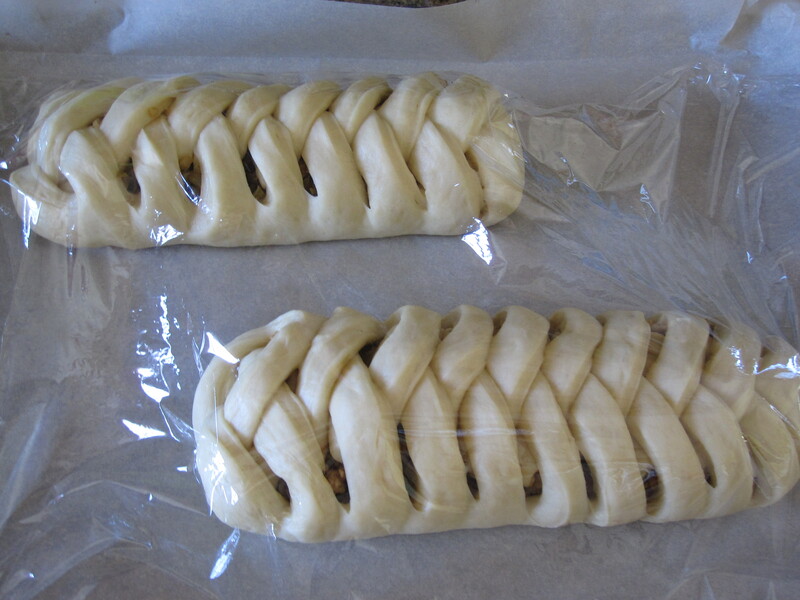 Then pull strips, alternating, to the other side crossing over the filling. 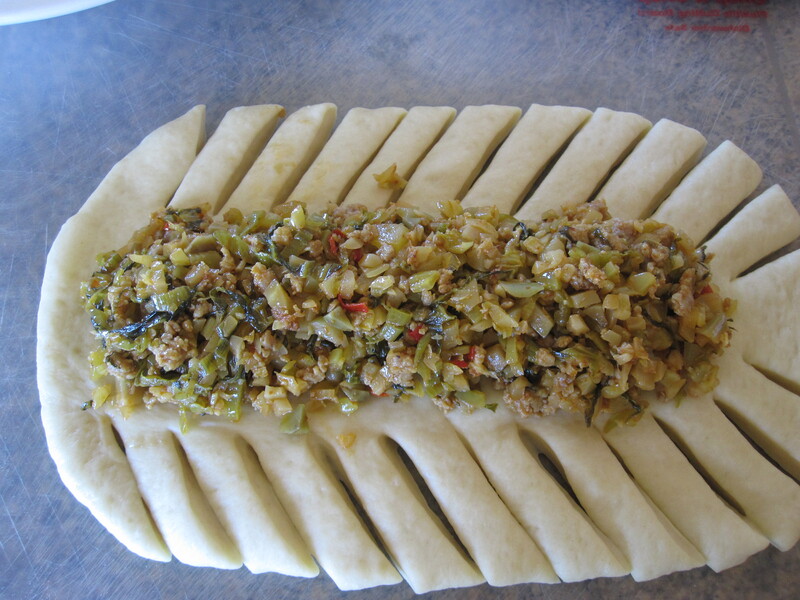 Before pulling the last two strips, fold in the end piece over the filling first. For the last strips, just tuck in at the bottom (see pictures below). Place on a large baking pan (greased or lined with parchment paper). Cover with plastic wrap and let it rise slightly again (it takes from 30 minutes to 1 hour depending on room temperature). Apply egg wash on the bread then sprinkle sesame seeds on the top. Bake in preheated 350°f oven for 20 minutes or until golden brown. Remove from pan and cool on a rack. 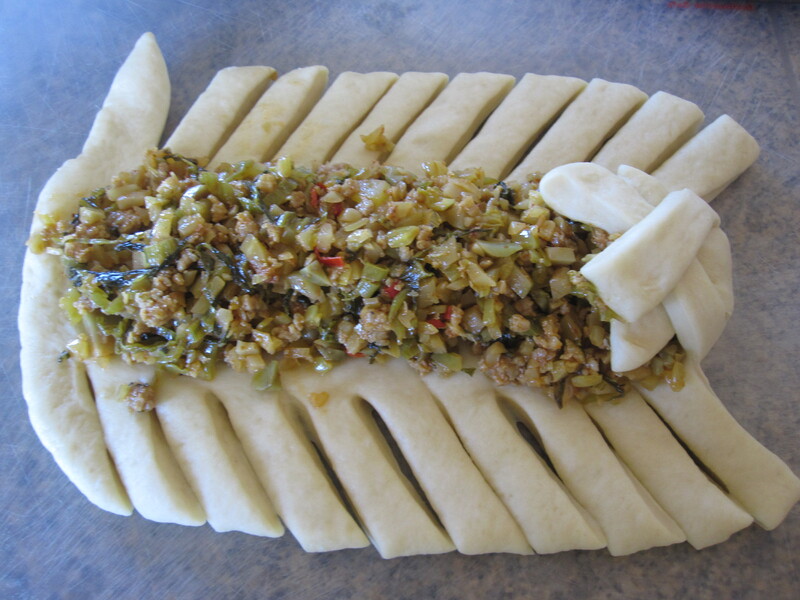 Prepare preserved mustard green 咸酸菜: Rinse off the marinade from the package then chop. Wash chopped preserved mustard green in a bowl, squeezing a couple of times during washing. Repeat washing and squeeze dry. Set aside. Prepare pickled mustard 榨菜 same as above. Heat up 3 tbsp oil in a hot wok, add in garlic and hot peppers, saute until aromatic. Add in ground pork, keep stirring to loosen up the meat. Add in both types of mustard, saute for a few minutes. Add sugar and chicken bouillon powder (I didn’t add salt as the mustard are salty already, sugar was added to balance the saltiness). Saute for another couple of minutes. Let it cool and it’s ready for use.